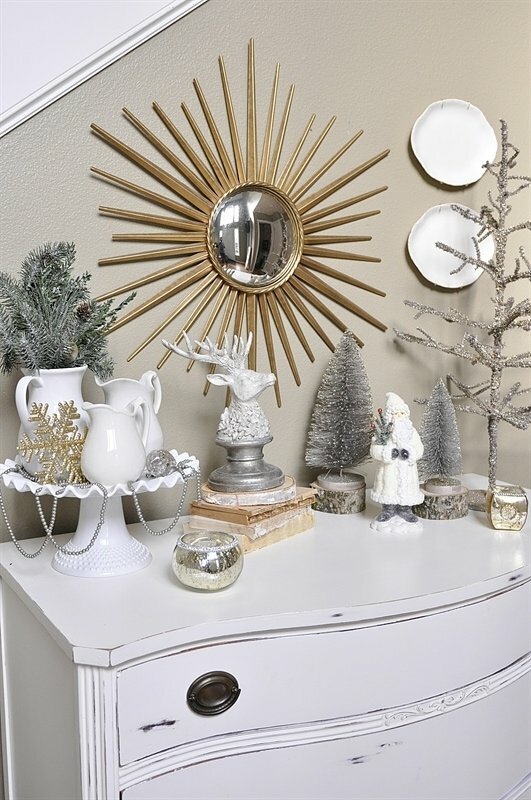 Today I am going to share the rest of the Christmas decor in my home. Since I redeocrated my living room and dining room earlier this year I feel like the rest of my house doesn’t fit anymore. There is definitely a difference in style. I’ve already got plans for some more redecorating after the first of the year! 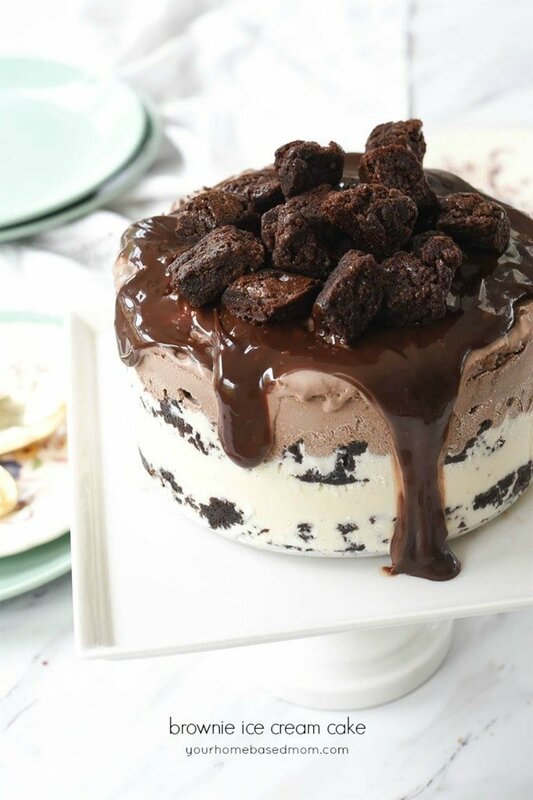 My husband can’t wait!!! 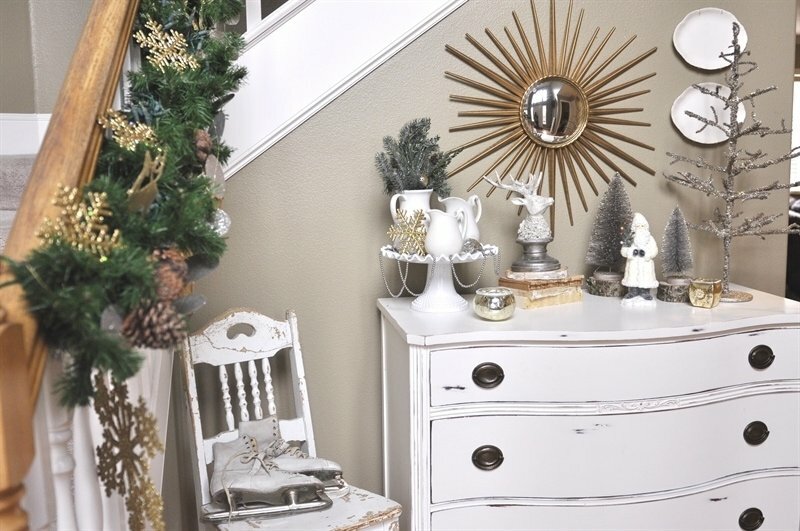 Go here to see my 2014 Holiday Home Decor }Part One. 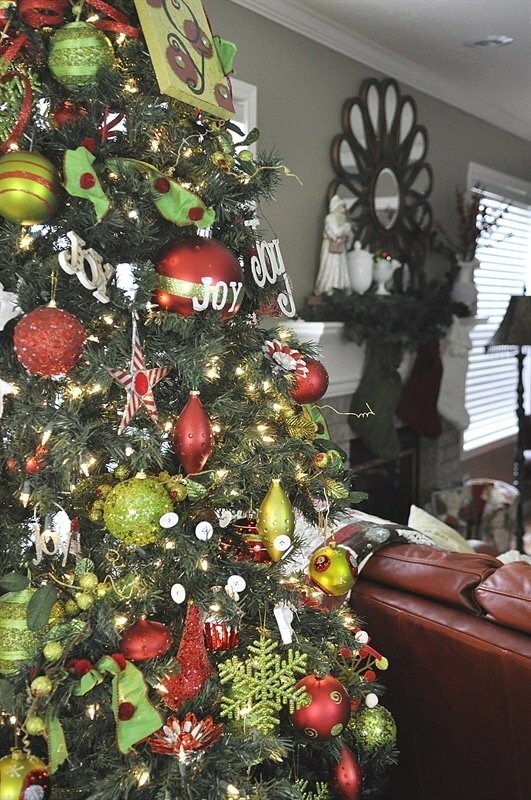 I use the more traditional red and green Christmas colors in the decor in my family room. My family room is a very difficult room to take pictures in. Not much natural light, and with the rainy gloomy days we’ve been having lately in Portland it was a real challenge. Did the best I could and I hope you will enjoy the little tour. But first for the entry way. I love the antique dresser I picked up at a garage sale for $35.00. I gave it a couple of coats of white paint and I totally fell in love. It is fun to dress up and decorate for the different holidays. As you will see as we tour through the house I have a slight obsession with bottle brush trees. There were a few in the living room too! 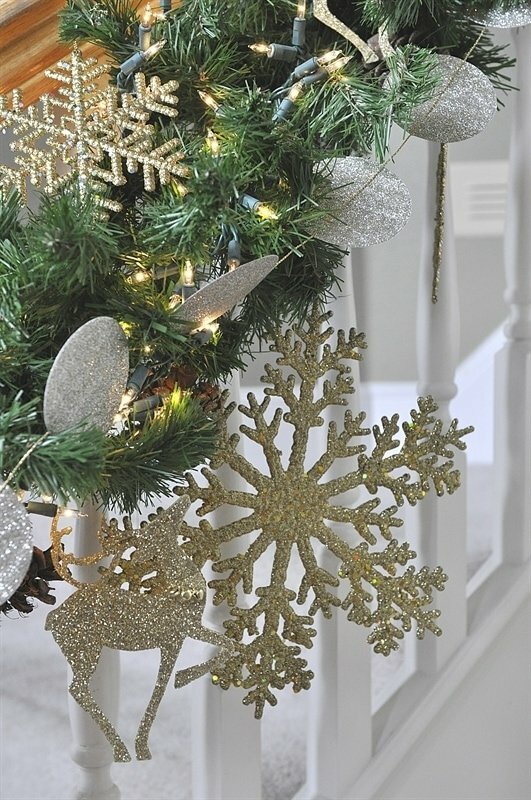 My least favorite thing to decorate in my home for the holidays in my bannister. 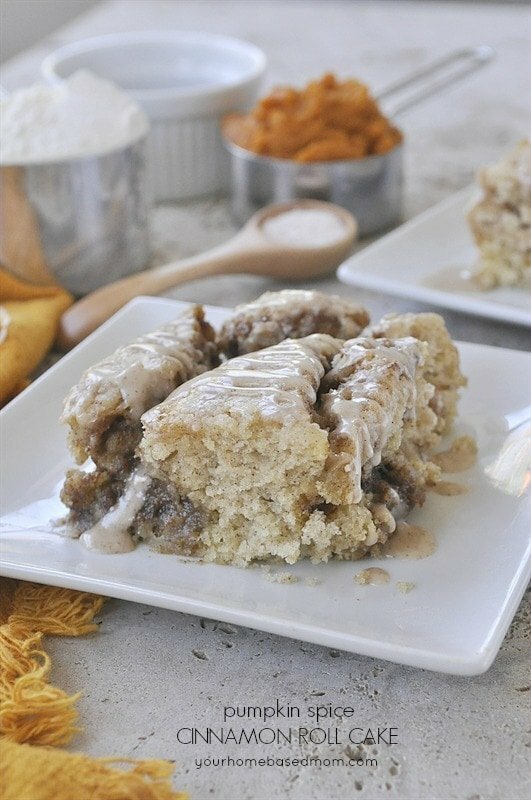 Each year I threaten I’m not going to do it and I always cave in and do it. This year I only did the bottom half though. I’m a rebel like that! 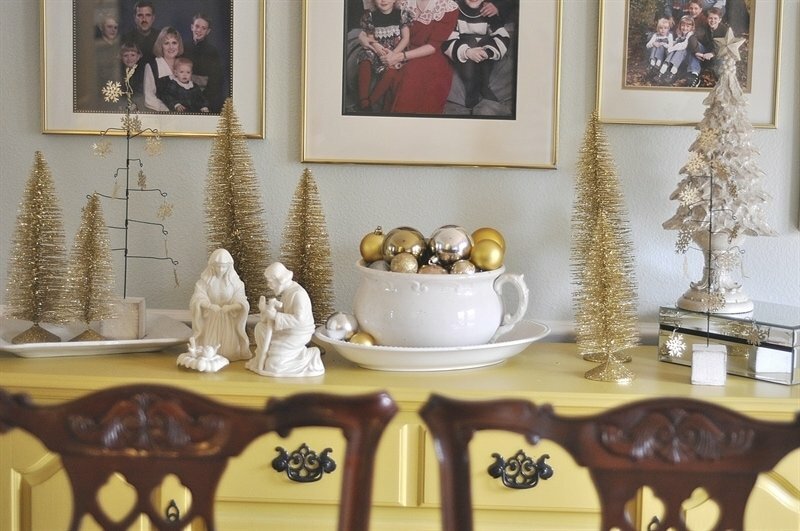 I have a fun yellow sideboard in my dining room which provides a nice flat surface for some holiday decorating. I found t hese fun bottle brush trees at Home Depot. Who would have thought! You also get a little sneak peek at our famlily portrait gallery. 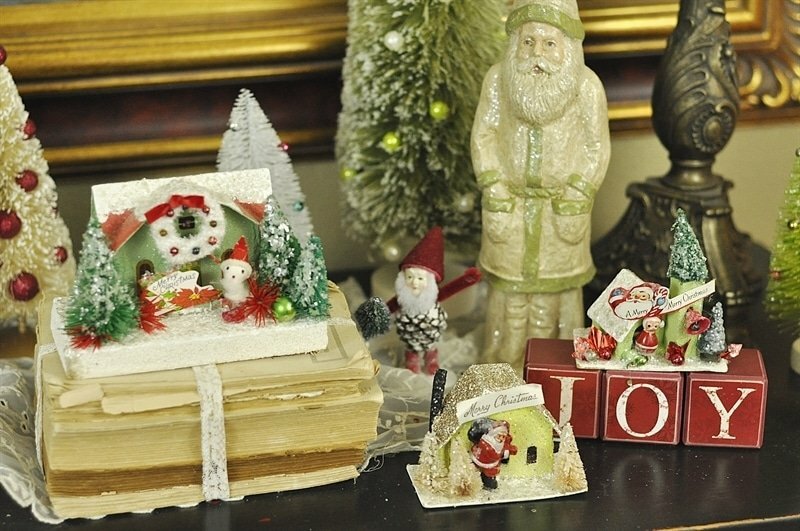 I love filling various containers full of Christmas ornaments for quick and easy decor. You’ll see a few more as the tour continues. Now into the family room. This is my Joy themed tree and decor. 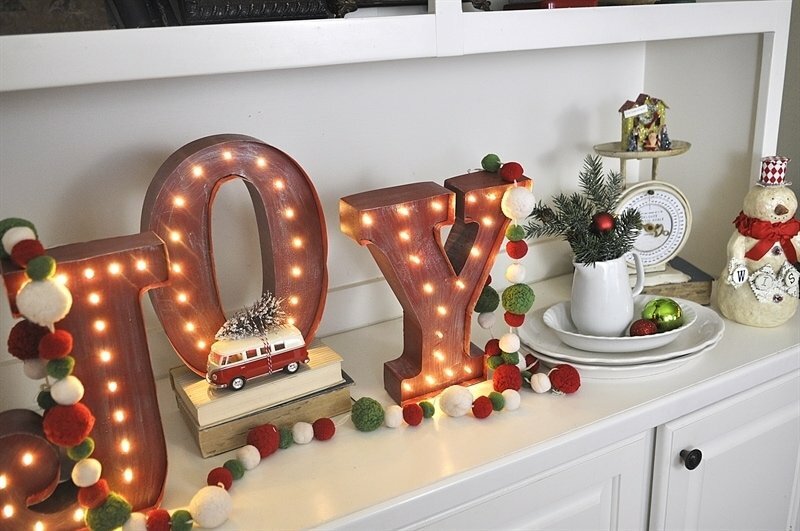 I love the word Joy and Christmas is the perfect time of year to decorate with it! Here is the Joy tree! 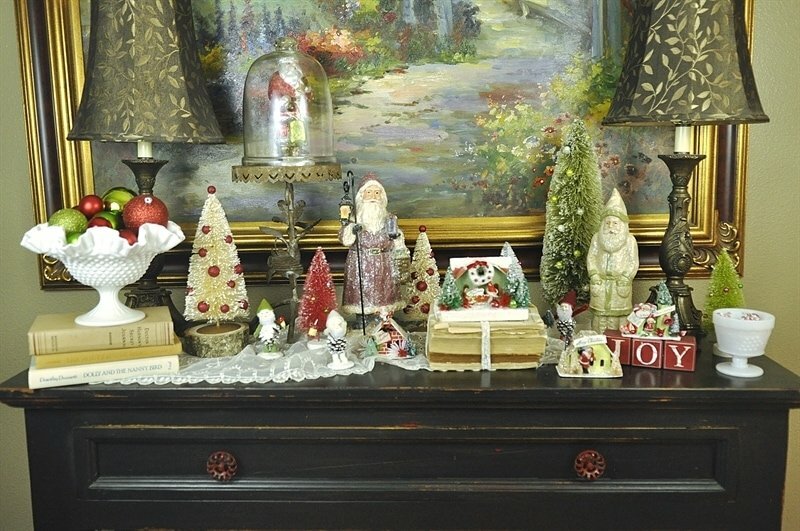 You saw some of my fun glittered putz vintage inspired houses and I have a few more here in the family room too. I purchase them from a lady here in Portland that makes them. I add one or two to my collection each year. 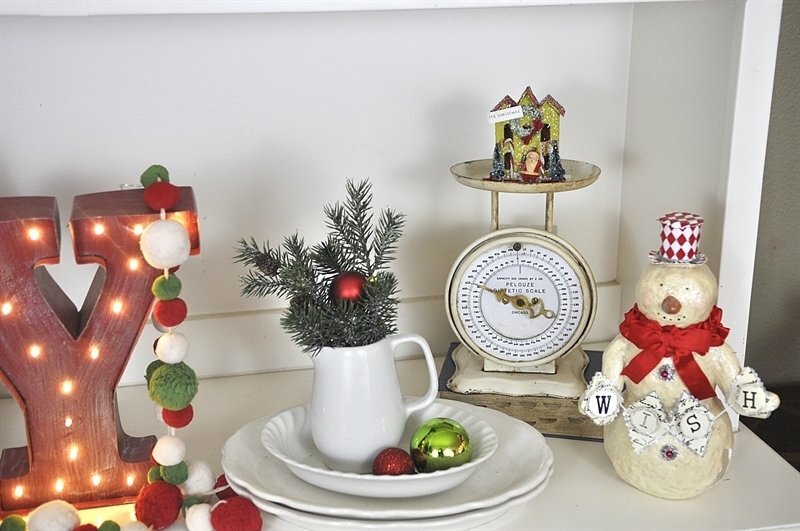 I also love using my white milk glass collection in my holiday decorating, filling them with candy, ornaments or branches. 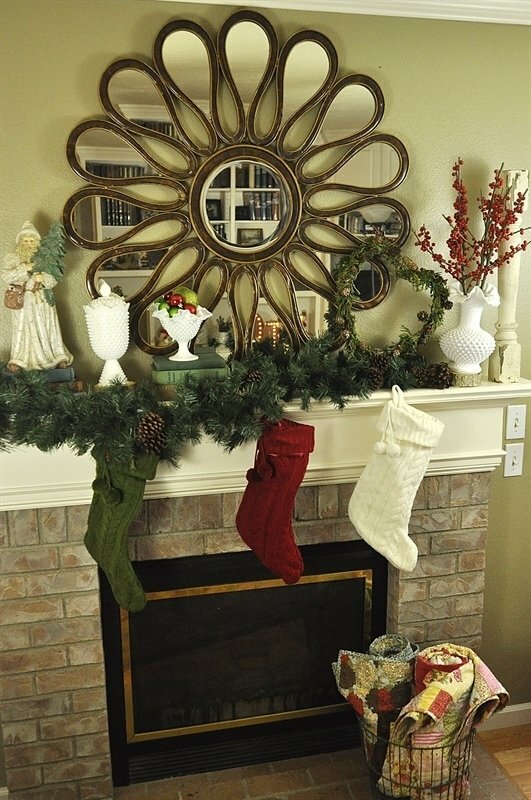 This year there will only be three children home for Christmas, so only three stockings. 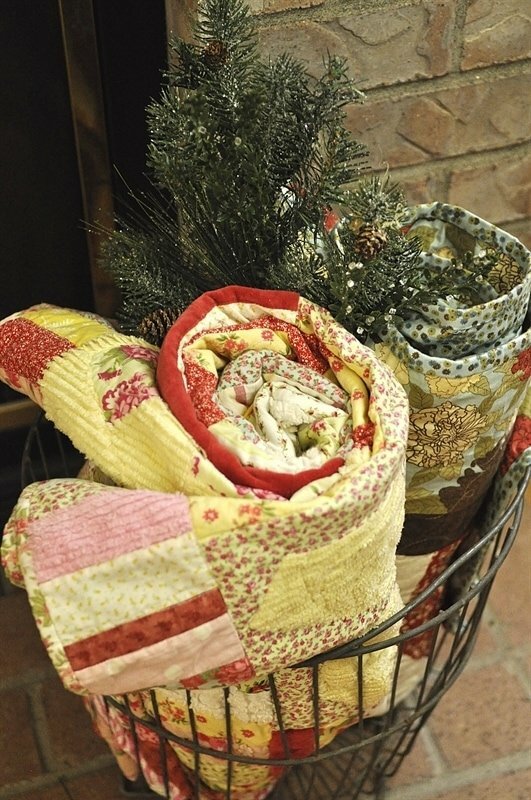 I love filling my old vintage potato basket full of quilts I have made. 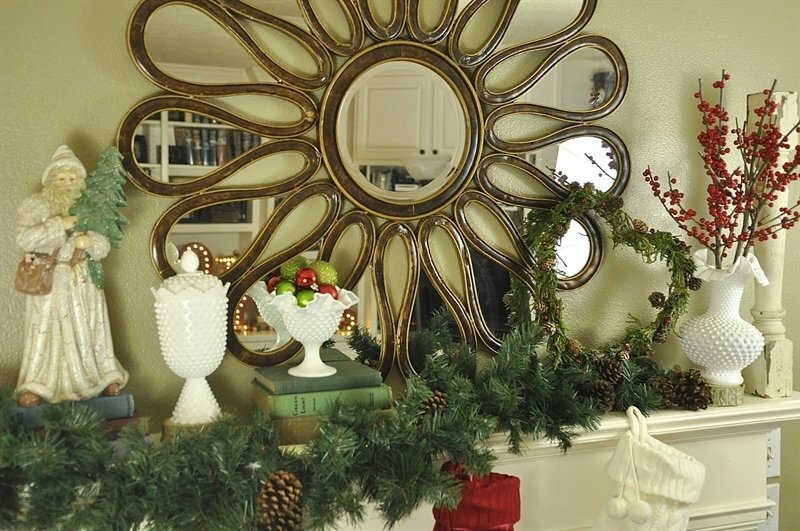 Adding a sprig of greenery into it makes it part of the holiday decor. As simple as that! 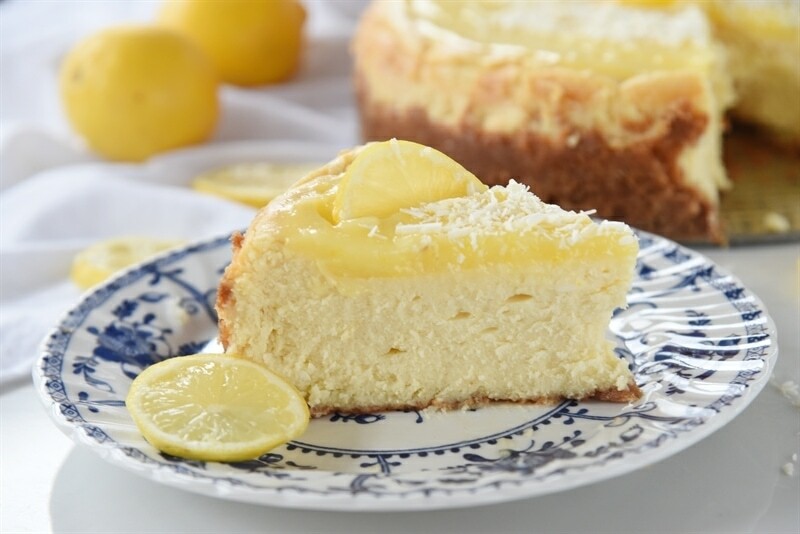 I have lots of flat surfaces in my family room which is great for decorating. 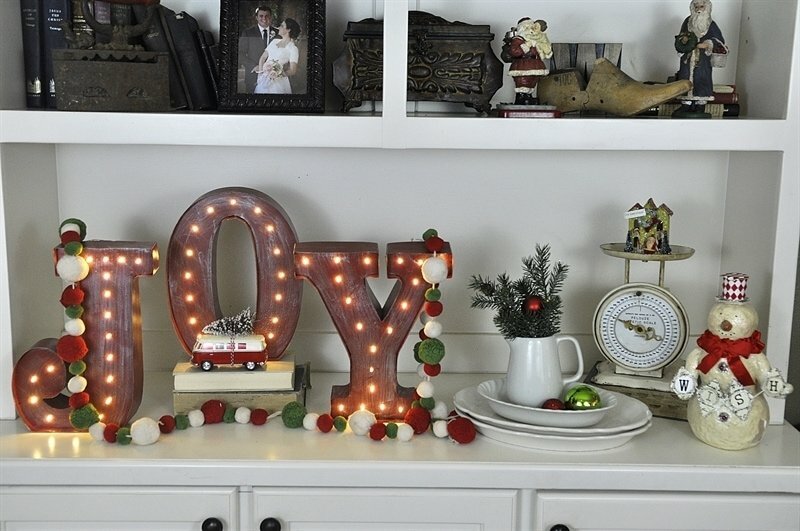 I found these fun Joy marquee letters this year at Orchard Hardware Supply Store. They are battery operated which is great. A few more vintage touches with some of my ironstone collection, old vintage scale and another glitter house. Santa isn’t vintage but he is pretty cute. That cute little Volkswagon Van came from CVS Drugstore and I added the bottlebrush tree on top. 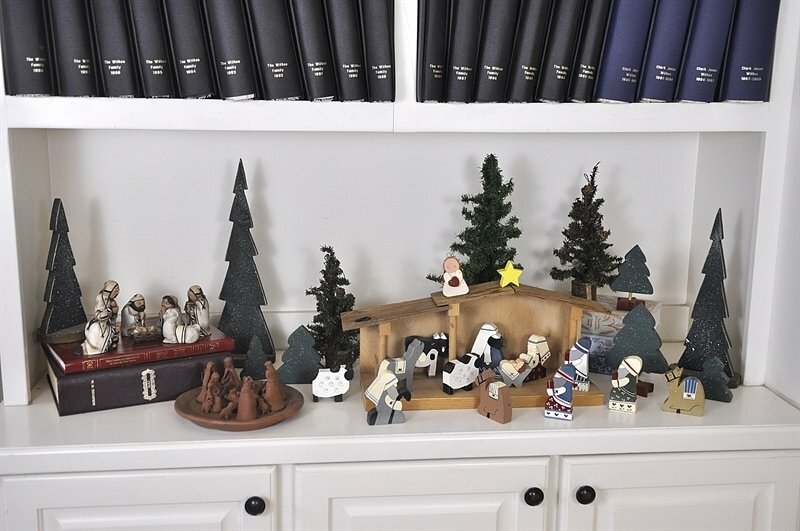 I like changing up my holiday decor each year but the one thing that stays the same, year after year, is the nativity scene. 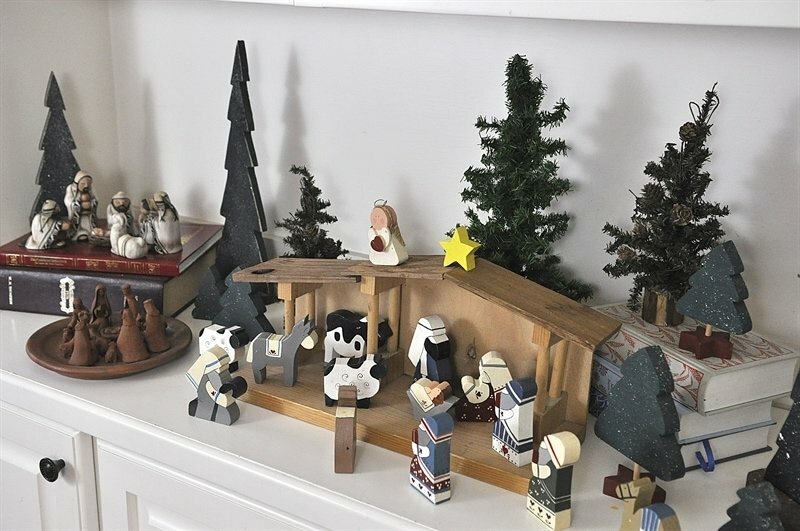 Jim and I made the painted wooden nativity over 20 years ago and it has a place of honor each year. In fact, there are tooth marks on one of the wiseman when my now 28 year old son used it as a teething ring. The other two nativities came from Argentina and Chile where my boys served as missionaries for our church. There you have it! I hope you enjoyed the tour of my home. I love decorating for Christmas and I hope you enjoyed seeing it! For a tour of my living room holiday decor go here. Your home is beautiful and I especially love the way you have decorated for Christmas. 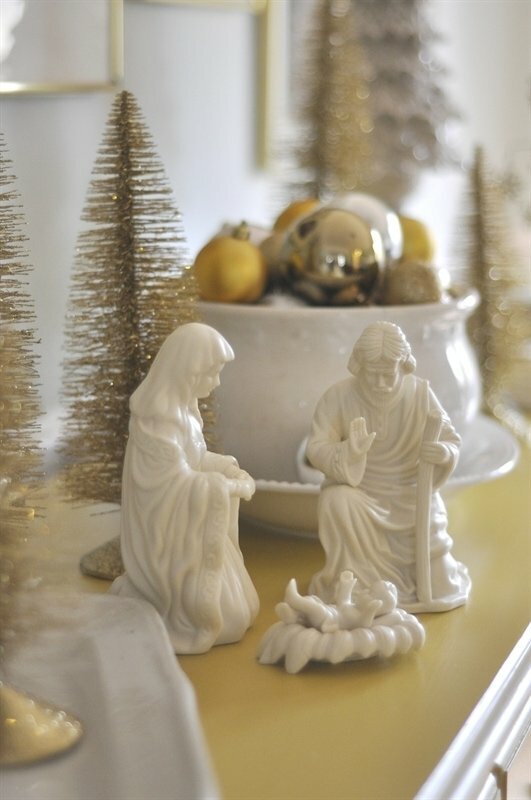 We recently moved to Orem from Layton Utah and had to give so many lovely Christmas treasures from over the years to Deseret Industry as we were moving into a smaller condo. So I enjoyed looking at your beautiful things. 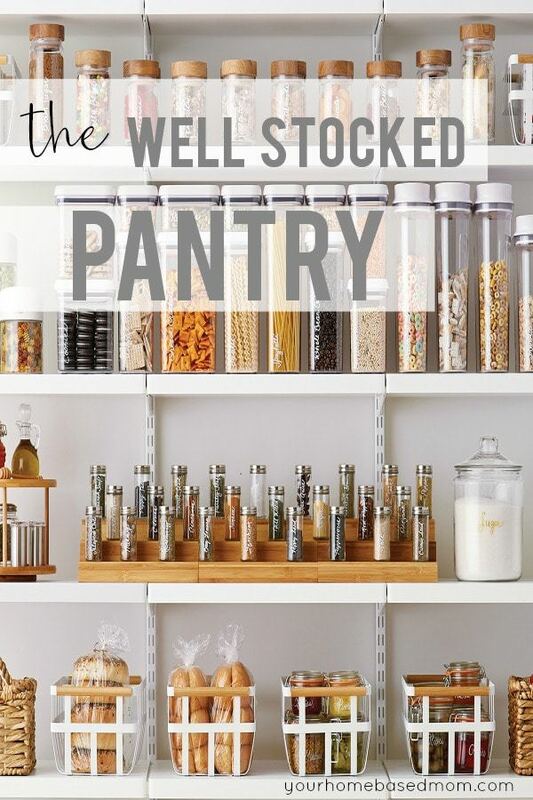 As well as all of your yummy recipes. 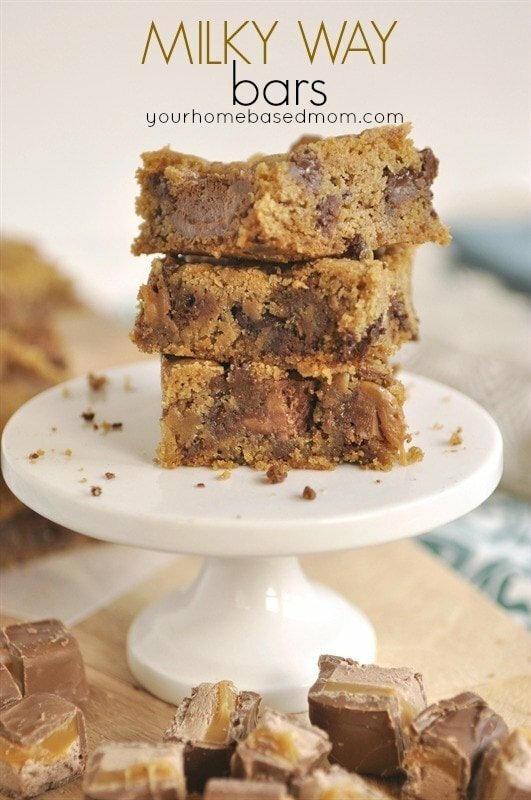 Thanks Leigh Anne and Merry Christmas to you and your family.